Since 2011, Gaurav has been an artist-in-residence at Southpoint School, an innovative school that focuses on the arts. He has been involved with various projects, including Theatre-in-Education (TIE) with the teachers and conducting workshops with many groups of children in the school. One of the most exciting projects has been with one group of students from class 10. Gaurav has worked with this group on an extended project over a year to train them in theatre and perform “Banaras ka Saudagar,” a Hindi adaptation of Shakespeare’s “The Merchant of Venice”, set it in Varanasi, the children’s own hometown. The group rehearsed for three months, and performed in Varanasi and Lucknow in a number of locations with great success. 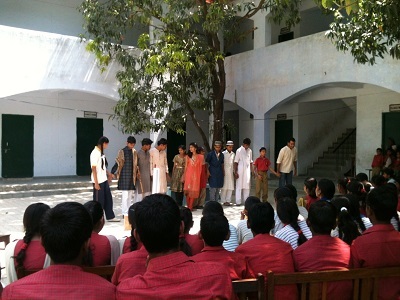 Read an article about a show in Lucknow performed at Sanatkada.